Does your infant act colicky? Did they have a traumatic birth? Does your infants head movement seem restricted? 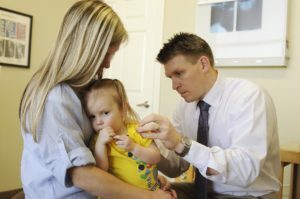 Does your toddler get ear, nose or throat infections frequently? Did they suffer injury such as torticollis? Dr. Collard has seen amazing results in infants and children suffering from these and many other commonly “dealt with” symptoms. 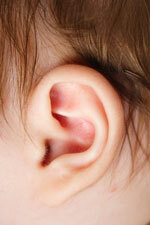 Many have used several series of antibiotics for ear infections without any improvement. Because young children are so resilient most see results after 1 or 2 visits in our office. The problem usually will be corrected within 3 to 5 chiropractic treatments. No need to be afraid! The “adjustment” is not the same as what is used on adults. It is a small gentle motion that is done while the parent holds the infant or child. Ear infections aren’t the result of a drug shortage or deformed eustachian tubes! Our bodies have an incredible capacity to fight infection. When that ability is impaired, it means something else is going on. It surprises many to learn that some of the nerves that control, regulate and monitor the ear begin in the brain stem, continue down the spinal cord and exit out from between the bones of the spinal column. Changes to the function of the bones in the upper neck can compromise the quality of the nerve signals to and from the brain. Obviously, this can affect the ability of any organ or tissue, in this case your child’s ear, to “defend itself” from infection. Our approach is simple. When parents bring their child for us to check, we look specifically for distortions in the upper spine. If nerve tension is detected, we gently reduce it with safe and natural chiropractic adjustments. This helps restore nervous system integrity. For a child or infant, this usually requires little more than a light touch with our fingertip at just the right place and direction. If a baby is inconsolable, it’s hard to know if it’s a digestive disturbance. Consider another explanation. Upon examination, we often find spinal distortions or in the baby’s upper cervical spine. These babies are probably suffering from head and neck pain. This is especially common if there was a difficult birth. Shoulder dystocia is another possibility, but both can cause long term effects. Is very painful to your infant. Dr. Collard is able to give relief to your infant. This is a correction and realignment of the neck shoulder and back it is gentle and safe. When you try feeding your newborn does he/she cry? When you lay them down does he/she only turn their head one way? Will they only nurse on one side? Even under the most optimal birth experiences subluxation to the spine can occur. Many are very minor and go unnoticed. In a South African study by Mercer and Cook, thirty infants diagnosed with colic were randomly divided into two groups. One group received chiropractic care while the other group did not. Within a two-week period, the chiropractic care group saw a complete resolution of symptoms in 93% of the infants. A Danish study (Klougart et al., 1989) looked at the effects of chiropractic care with colicky infants. Their published report indicated that 94% of parents saw improvement in their baby’s behavior within two weeks of beginning care. But chiropractic isn’t a treatment for colic! If subluxation is present, interfering with the proper function of any part of the body, restoring proper nervous system control allows the body to heal. This can happen regardless of age and regardless of what the symptoms are called. Consult our office for a no-obligation consultation. Give us a call to set up an appointment 801-569-1141. There is no need for a new mother to feel the sense of helplessness. Up to the age of four or five, most children have poor bladder control at night. But after that, the inability to stay dry at night is a sign of an underlying problem. While chiropractic is not a treatment for bedwetting (nocturnal enuresis), countless children have been helped with safe and natural chiropractic care. During the early years of life, the sacrum has five separate segments. Later, they fuse together to form the triangular-shaped bone that adults have at the base of the spine. If these segments misalign (falling, learning to walk, ride a bike, etc.) they can compromise nerves that are responsible for bladder function. We look for these sometimes subtle misalignments during our examination. When these misalignments are reduced with safe and natural chiropractic adjustments, nervous system control and regulation of the bladder can be restored.